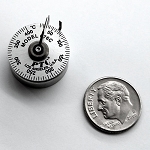 PTC® Miniature Spot Check® is designed to measure surface temperatures, especially where space is limited. The bimetal sensor comes in close contact with the surface to be measured, which provides the thermometer with a fast response time. The small size makes for minimum "heat-stealing" from a part or surface. A lazy hand (max pointer) is held by a magnetic clutch and indicates the highest or lowest temperature reached in a given period. It will hold this reading despite the vibrations and jarring of normal use and can be reset indefinitely. The 675 Series can be used for determining heat leakage from ovens, hot air ducts, and other installations. 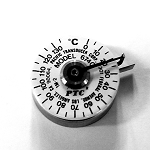 These thermometers can also be used for measuring the temperature of heat sinks, heat exchangers, laboratory heaters, platens, and hot plates. 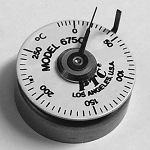 The 675 Series can be used for testing the temperature of electronic parts. 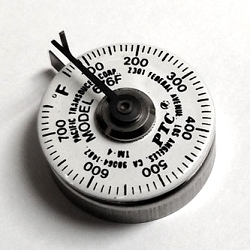 An isotherm of an area can be constructed by employing several of these thermometers and then plotting the readings. 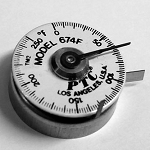 PTC® Miniature Spot Check® Surface Thermometers are Made in the U.S.A.